The challenge has begun! For the next 30 days I'm going to eat strictly Paleo. If you're not exactly sure what that means, check out yesterdays blog post. I plan to share with you pictures of the process, meals I make (watch out folks, this could get dangerous) and how I feel along the way. Yesterday I grabbed my shopping list from Practical Paleo and went to Central Market to stock up the kitchen with what I need for the week. Then I spent about 2 hours in the kitchen preparing a few meals for the week. 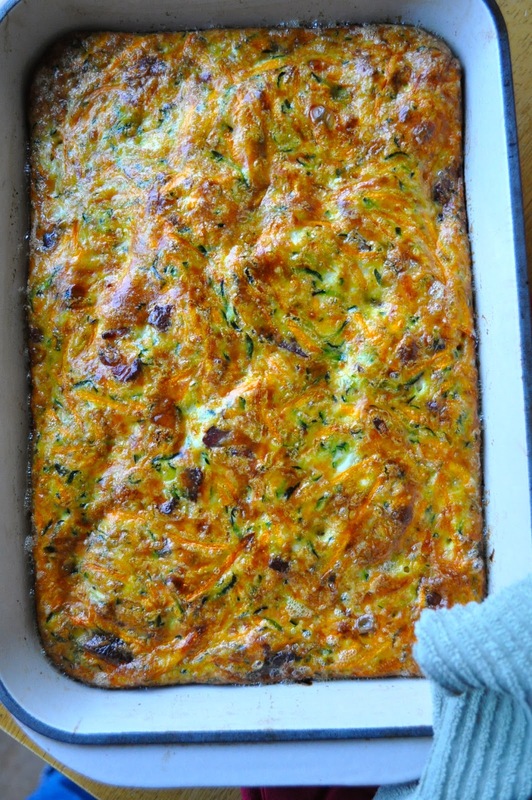 Meal #1 was this Carrot, Zucchini Crustless Quiche with a side of bacon. It was so easy to whip up and super healthy! Silly me, I forgot to snap a photo, so this picture is borrowed from heywhatsfordinnermom.com. She chose to include the bacon in her quiche, whereas I simply enjoyed mine on the side. Feel free to get creative. Set your oven to 375 degrees F. Combine herbs for seasoning. Shred carrots and zucchini (draining zucchini with a towel or cheesecloth). Scramble eggs in a bowl. Grease your 9x13" pan with coconut oil. Pour egg mixture in with shredded veggies, adding the seasoning. Mix well and pour into greased baking dish. If desired, use a fork to make several swirls in the mixture. Once the oven is preheated, bake for 35 minutes, or until the edges are golden brown. Enjoy! In review: I wish I had added more zucchini. Once you drain the shredded zucchini it cooks down to very little. I also chose to add a dollop of salsa on top of my quiche this morning for some extra kick. Otherwise, I thought it was delicious. The quiche has a hint of sweetness to it as a result of the coconut oil I used, which I really enjoyed. Let me know what you think!